The Supreme Court on Wednesday sought the response of the Central Government and the Bar Council of India (BCI) on pleas challenging the constitutional validity of the advocates-on-record (AOR) system in the Supreme Court on the ground that they prohibit all lawyers from independently practicing before it. 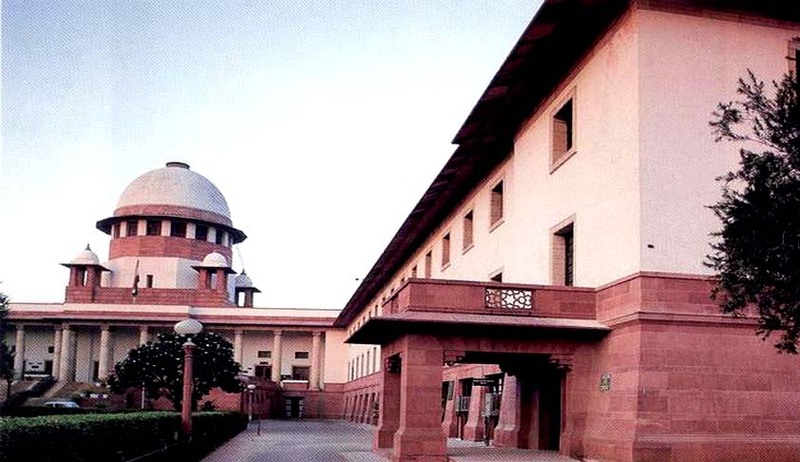 A Bench comprising of Justices Anil R Dave and Justice V Gopala Gowda also issued notice to the Registry of the apex court on the pleas filed by some members of Supreme Court Bar Association (SCBA). Presently, cases can be filed only through an advocate-on-record (AOR) in the Supreme Court, while non-AOR lawyers cannot file cases in the Supreme Court on their own. "This is against fundamental rights," senior advocate Ram Jethmalani, appearing for some SCBA lawyers, submitted before the Bench. Another senior lawyer KTS Tulsi also endorsed Jethmalani's submission. SCBA members Birendra Kumar Choudhary, Dilip Kumar Thakur and Chava Badri Nath Babu, in their plea, have sought an order "declaring and holding that the Section 52(b) of the Advocates Act and Order IV, Rule 1, 5, 7(a) (i), (b) (i) and 7(c) of the Supreme Court Rules are ultra virus to the Constitution of India and the same be quashed." The petitions allege that these provisions are against the fundamental rights of lawyers. Referring to a provision of the Advocates Act, the plea said it provided every advocate an equal right "to practice in all Courts including Supreme Court as well as before Tribunals and authorities." "That SCR (Supreme Court Rules) 1966 was repealed and the SCR 2013 came into force w.e.f August 19, 2014 and like SCR 1966, the new SCR 2013 also contain the dual system of AOR despite notification of Section 30 of the Advocates Act 1961 on 15/6/2011. "The new SCR 2013 did not take cognizance of the changed circumstances in the law governing the right to practice of advocates in all courts including Supreme Court after notification of Section 30 of the Advocates Act," it said. Delhi High Court in Balraj Singh Malik v Supreme Court of India through Its Registrar General (AIR 2012 Delhi 79; decided on 13th February, 2012)upheld the constitutional validity of the AoR system. In July 2013, Advocate Lily Thomas in an interview with Live Law suggested that the Supreme Court does not have the power to subject advocates to this Examination. According to her, Section 30 of the 1961 Act provides that all advocates have the right to practice in all courts across the country including the Supreme Court and that no restriction could be imposed on that right. She had also stated that under the 1961 Act, there can be only two classes of advocates i:e ‘Advocates’ and ‘Senior Advocates’. It was Lilly Thomas who challenged the AOR system for the first time in Supreme Court [[In Re: Lily Isabel Thomas vs Unknown AIR 1964 SC 855]. Recently a Writ Petition seeking removal of the provision of Advocate on record (AOR) from Patna High Court has been referred to a full Bench by a Division Bench of Patna High Court comprising of Chief Justice L. Narasimha Reddy and Justice Vikas Jain.